The science behind the Star Wars destruction device. Sci-fi writers and fans all agree; destroying a planet is pretty cool. Possibly one of the most iconic and cataclysmic scenes showing the obliteration of a planet is when the Death Star destroys Alderaan in Star Wars: Episode IV – A New Hope. In the famous dialogue between Luke Skywalker and Obi-Wan Kenobi, its size was hinted at, “… he’s headed for that small moon.” “That’s no moon… It’s a space station.” The exact mass and diameter of the object are never explicitly revealed, but various sources suggests it is between 87 and 100 miles (140 to 160 kilometers) across. For comparison, our moon is around 2,160 miles (3,476 km) across. 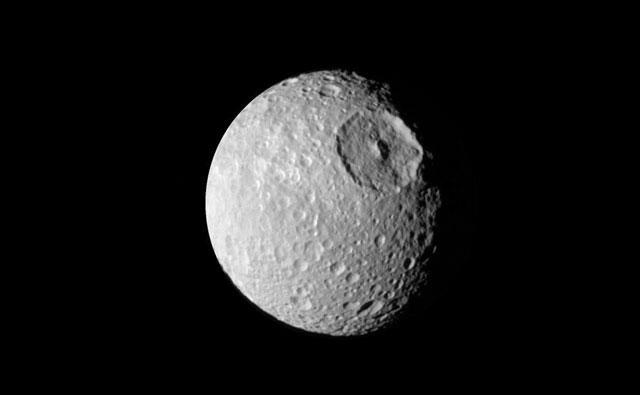 There aren’t really any well-known moons in the solar system to compare the Death Star to, though it does bear remarkable resemblance to the Saturnian moon, Mimas. There is a mysterious (in other words, “unexplained”) power source at the core of the Death Star. This gives us a little bit of scientific leeway to imagine potential sources of power for the death star. For starters, we know that the planet-annihilating Death Star uses a single pulse from a laser-like apparition to destroy its target in just a few seconds. (Alderaan was gone in 3). In those few seconds, you can see at least one substantial chunk of the planet get ejected into space (leaving the top-center of the explosion) with a significant amount of force. In order to understand the Death Star’s power, we need to understand the target. Alderaan and Earth are very similar, so we’ll look at what it would take for the Death Star to destroy Earth. For that, the Death Star would have to overpower the forces that hold the planet together—in this case, gravity. The gravitational binding energy of Earth is 2.24*10^32 Joules (that’s 240 followed by 32 zeros). As a point of comparison, the Sun spits out 3.8*10^26 J (around 380 septillion Joules) of energy each second, which comes from the conversion of 4.3 billion kilograms of its mass into pure energy through nuclear fusion. We would need the same amount of energy the Sun produces in a week—all of it hitting Earth in 1 second—to deliver the same punch. What About the Death Star? Let’s assume that the green light of death is just a “simple” laser. In that case, it would have to generate all of the energy for the laser aboard the space station, which would be horrifically inefficient and very impractical. Firstly, the Death Star and Newton disagree, specifically where his third law of motion is concerned. Since every action has an equal and opposite reaction, the Death Star would fire (or “push” ) the laser, and the laser would “push” (more like recoil) in return. Assuming the death star weighs as much as the moon, if it fired 2.24*10^32 J of energy, it would accelerate about 48 miles (78 km) away from Alderaan per second. Though, if you look closely, you’ll see that there isn’t noticeable recoil. Then, of course, there’s that whole heat diffusion issue, which would probably vaporize everything in the laser’s vicinity (including people standing next to it). If we assume the Empire is more clever than that, what else could they use? Antimatter seems to be a likely solution. With a pure antimatter bomb, the Death Star wouldn’t have to supply all the energy needed to blow Alderaan to smithereens—only half (about 1.24-trillion tons). Alderaan would supply the rest. 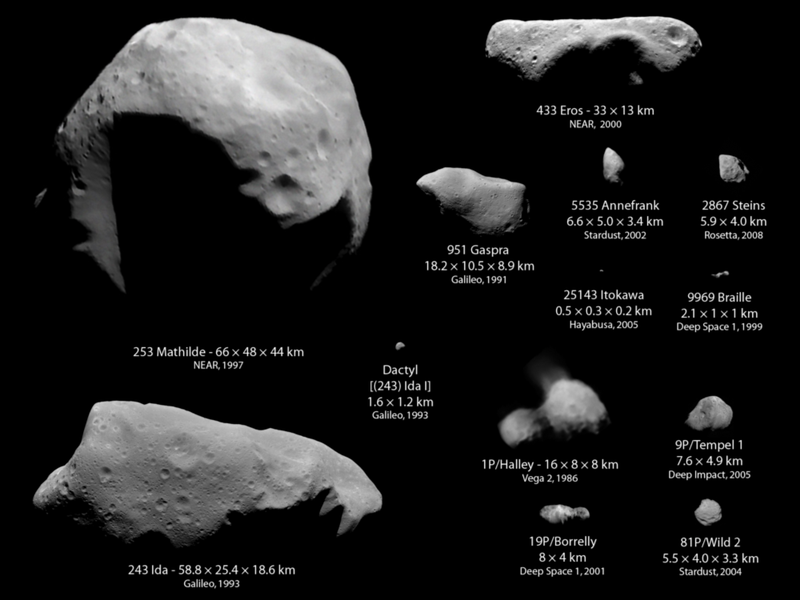 Asteroid 5535 Annefrank (upper right) weighs about 1.24 trillion tons; Many other asteroids in the montage do as well. If we look at the volume of Annefrank, that’s about 112 cubic kilometers. For the sake of argument, if we assume the Death Star has a diameter of 160 km (99 miles), and is a perfect sphere, its volume must be about 2*10^6 cubic kilometers. 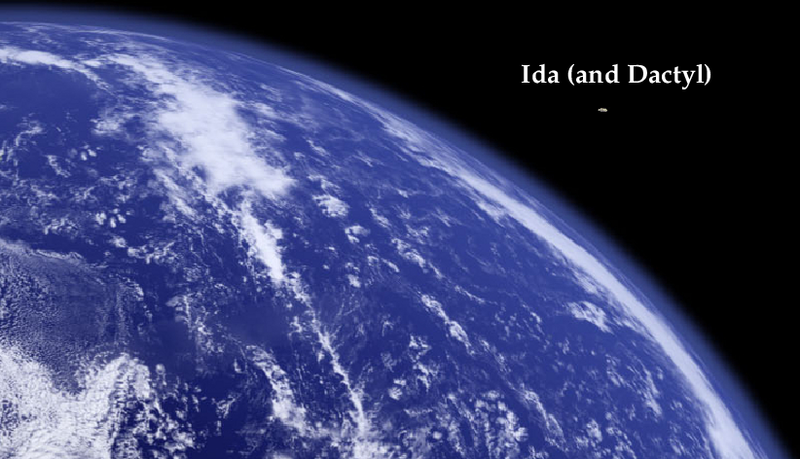 In the picture below, Ida and Dactyl (its moon) are compared to Earth (shown to scale). Annefrank, which is just a tenth of Ida, would be about the size of a single pixel at this scale. So, it’s perfectly reasonably that a tiny amount of matter (or, in this case, antimatter) could destroy an entire planet. The biggest problem the Empire would face pertains to the manufacturing and storing of the antimatter. It’s conceivable that the Death Star could produce the antimatter on-site (eliminating the need for refueling). Then, the antimatter would need to be kept completely isolated from other matter, because antimatter is the antithesis of matter—when they come in contact, they destroy one another . This method is also very scalable; in the end the Death Star would only need to fire a beam of antimatter 0.00000002% of any planet’s mass to overcome its gravitational binding. Past that, the more antimatter you throw at the planet, the bigger the boom. So if you want to send chunks of a planet flying off into interstellar space at high velocities to properly terrify your enemies, just toss in some extra antimatter, sit back, and enjoy the ride—it will be rather smooth. A weapon as massive as the Death Star should experience very little recoil from firing an antimatter bullet.